I have never been so happy to have a blog of mine age so poorly. A couple of days ago I wrote about Sam Mikulak, the top male gymnast in the U.S. who has struggled in major international competition. Mikulak, a five-time U.S. national champion, had yet to earn a world or Olympic medal. He had been to two Olympics Games and three world championships. (This year’s worlds were his fourth.) You couldn’t help but wonder if it would ever happen for him. Mikulak, 26, had two especially heartbreaking finishes in the all-around at the world championships. The first one came in 2013 when he was in second place heading to the final event: high bar. He faltered there and slid to sixth in the rankings. Mikulak did the same thing again a few days ago during the all-around final at the 2018 world championships. He was in third place heading into the last rotation and missed his grip on high bar, and slipped from a podium position to fifth. Not to mention a whole bunch of almosts: fourth at the 2013 worlds on high bar, fourth at the Olympic Games on high bar, fourth in yesterday’s pommel horse final, and fourth in today’s parallel bars finals. Once again, it all came down to high bar for Mikulak, the last event of the 2018 world championships. He qualified into the final in second place, behind Japan’s Kohei Uchimura, and ahead of 2012 Olympic high bar champion Epke Zonderland, who qualified in fourth. With the exception of his mistake in the all-around final, Mikulak hadn’t missed a routine on that event. 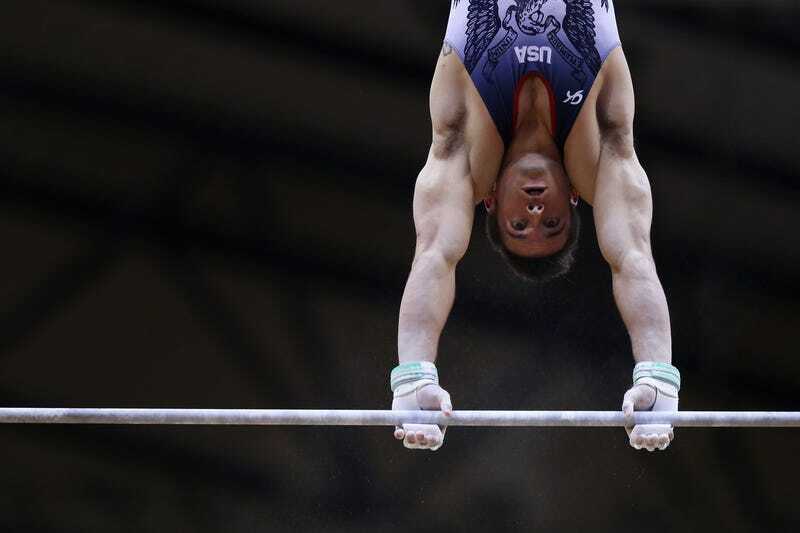 During the team final, he posted the highest high bar score to help the U.S. men to a fourth-place finish. He competed third in the lineup, right after a stellar routine from Zonderland, who won the silver last year after he caught his Kovacs—a tucked double back over the bar—with just one hand and managed to keep the routine going without losing his rhythm. This year was more successful for Zonderland, who caught all of his releases with both hands and stuck his dismount. Next up was Mikulak, who caught everything, including the release move that dashed his all-around hopes a few days. He landed his double twisting double layout with just a small hop forward to go into second place behind Zonderland with five gymnasts remaining. Only Uchimura would end up bumping Mikulak further down with his absolutely stellar high bar work. The Japanese legend took second place, pushing Mikulak down to third, which is where he remained until the end of the competition. Mikulak finally had his medal, a bronze on his best event. And he seemed particularly thrilled when he came out to collect it during the medal ceremony. In the post-meet interview, however, he mostly seemed relieved. He had finally done what he had been trying to do for years. He would no longer be the guy who had all the talent and ability, but none of the international accolades to show for it. “It’s been a big weight off my chest,” he said. The U.S. men’s program likely feels the same way. Mikulak’s medal means that the men will not go home empty-handed this year.